Accidents happen, you forgot to turn your iron off after you ironed your shirt or the lights are still on in the front room. Your first instinct is to turn around to unplug that iron, and it is extremely frustrating because you are going to be late for work. Leaving electrical devices on can be a serious fire hazard, and you do not want your house to go up in flames. Thank you to brand new technology because you will never have to turn around in a panic again. With the click of your phone application, you can now find out if you have left any major appliances on or if you forgot to turn the system. Now you have the option of relying on home automation services with a wireless plan. Now you can use your personal cell phone or a particular specialty remote control to turn the lights on or off, preheat the oven, or adjust the thermostat. You do not need to do anything at home anymore; it is all about your convenience. This type of home security is definitely expected to grow in the near future. 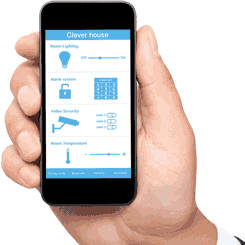 53% of home security systems offer a home automation service. So people are definitely catching on. These particular automation systems can control lighting, heating, ventilation, air conditioning, electronic appliances, and even electronic door locks. This is made possible by particular software that links these devices to a central control area such as a computer or a device, which can be accessed by the special remote. The remote makes everything easier and extremely accessible with a touch of a button. Surprisingly this form of home automation is cheaper, which makes these services easily attainable for families. Basic home automation systems start at $60 a month plus the installation costs from such companies as Protect America. Prices can go as high as $300. You have many different packages to choose from. You start off with basic packages, but it will get more expensive as you add on more equipment. You may want these services installed by your home security company, that will cost up to $1,00 depending on the control device, installation, and the size of your floor plan. The larger your home is, the more expensive it is because there are more entry points you want to cover. If you want to avoid these extra costs, you can purchase and install your home automation systems by yourself. It does in fact cut off a big chunk off your bills. If you need guidance you can go to your local Lowe’s and Home Depot to buy an automated systems. It even gives instructions and guides you while you are installing your device. If you are willing to spend the money, you should probably let a professional install it. You want your home automation system to be installed properly since safety is the number one priority.